It’s fall. 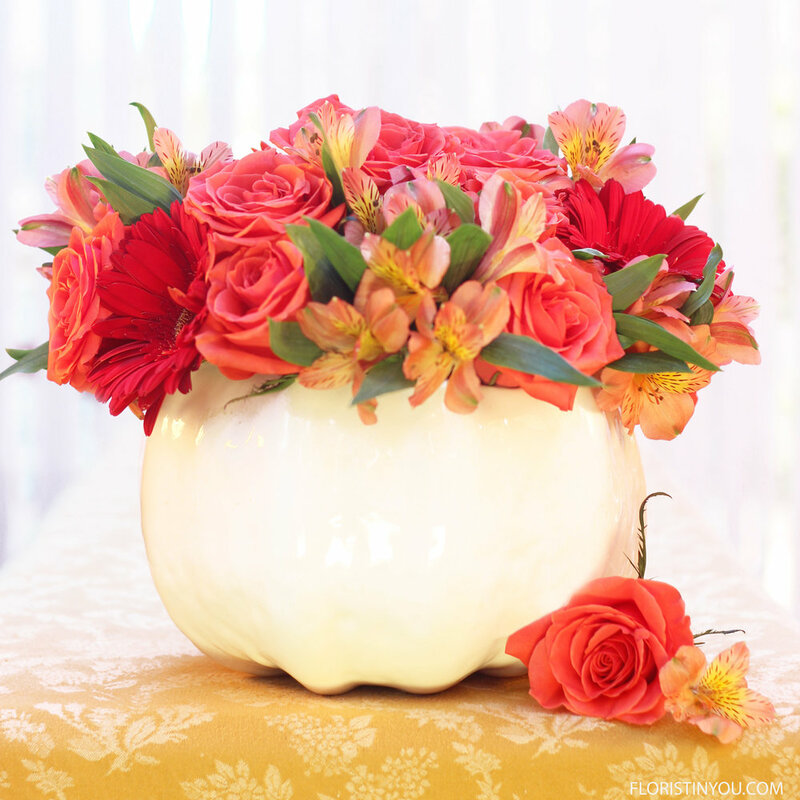 Here’s a bright centerpiece made in a white ceramic pumpkin that will add some color to any festivity. This arrangement looks good from all sides, it is low, so it’s great for dinner conversations and looks beautiful from the top too. You just need 3 bunches of flowers to make it and some waterproof tape. 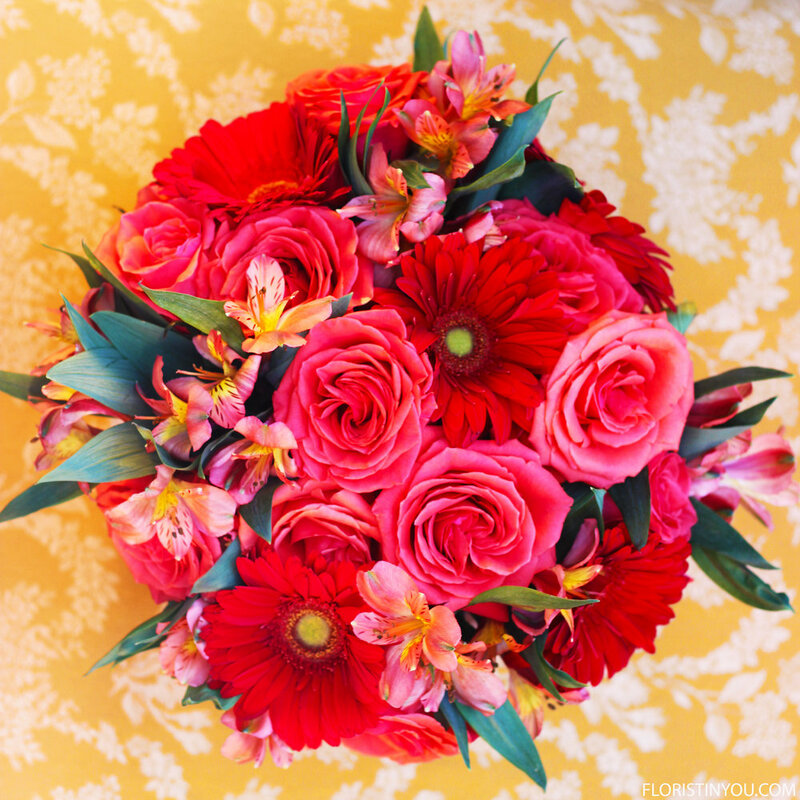 Floral Tip: Since this vase is very wide at the top, you can make a grid out of 1/2 inch clear waterproof tape to hold your flowers in place and keep them from falling out. Just make sure to wipe off the rim before you start, and after you have made the grid, take the tape all the way around the edge of the vase and it will securely hold everything in place. It’s easy. If you have you pumpkin vase, flowers and tape, let’s begin. This is going to be fun. Here are you flowers and vase. Fill vase with water to about 2 inches below rim. Add pack of floral food. Wipe rim of vase dry. Make grid out of water proof tape. Go around edge of vase with tape. Strip all leaves below the water line. Wire Roses and Gerbers. See link above for directions. 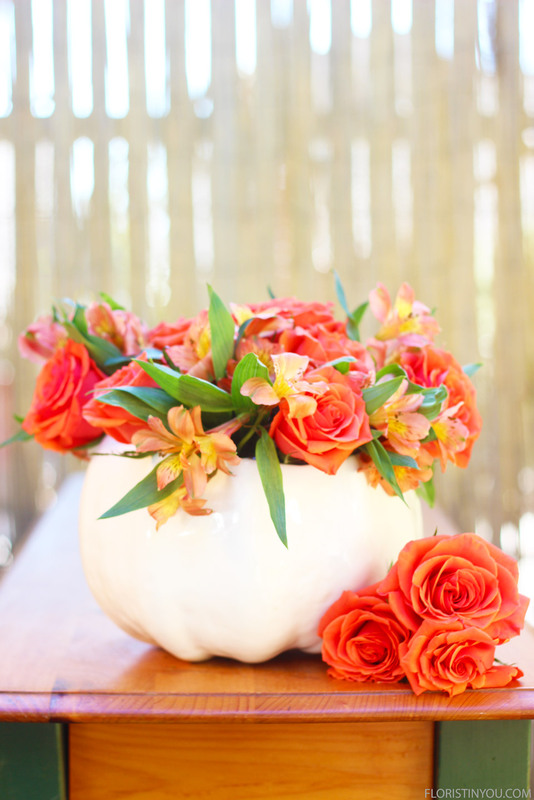 Start adding Alstroemeria with each Rose. Distribute Roses and Gerbers. Fill the vase. Distribute Gerbers evenly around rim. These colors really are hot. Roses and Alstroemeria close up.